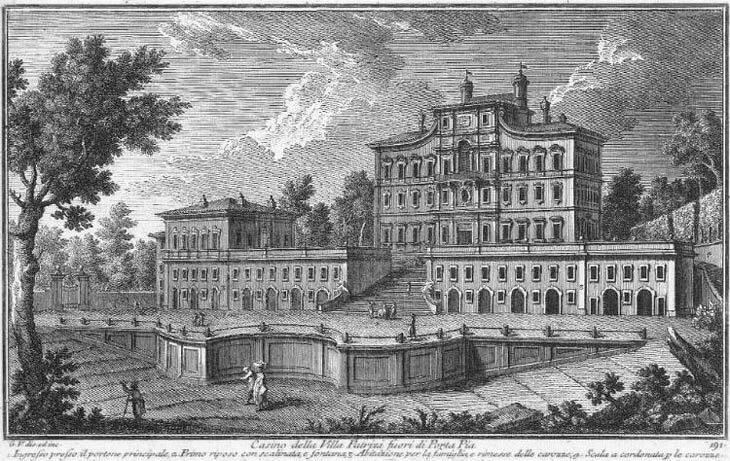 Villa Patrizi, designed personally by Cardinal Giovanni Patrizi and his two brothers, was erected in 1717 on a little hill immediately outside Porta Pia at the start of Via Nomentana. The view is taken from the green dot in the small 1748 map here below. 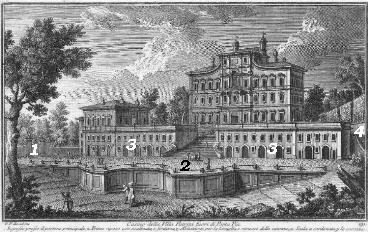 In the description below the plate Vasi made reference to: 1) Main entrance; 2) First Terrace; 3) Houses of the servants; 4) "Cordonata", access to the casino for the carriages. 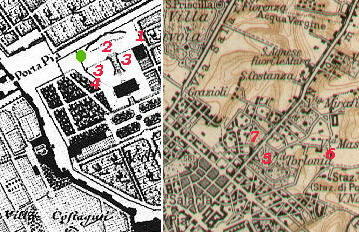 The coloured 1924 small map shows: 5) Villa Torlonia; 6) Villa Massimo; 7) Villa Paganini. Villa Patrizi, like Villa Ludovisi and Villa Peretti was sacrificed to the expansion of Rome after 1870. The site is now occupied by the Ministry of Transportation. 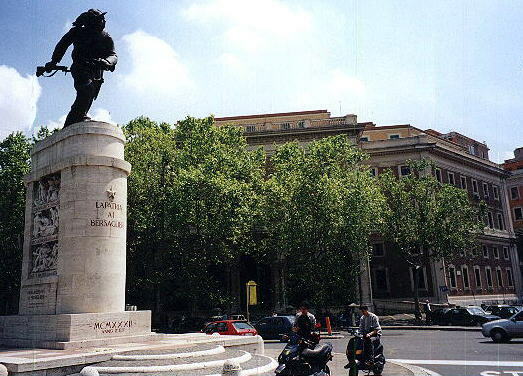 In the second half of the XVIIIth century Giovanni Raimondo Torlonia, son of a French merchant, founded his bank, which during the French occupation of Rome at the beginning of the XIXth century grew in importance and made the Torlonia one of (if not the) wealthiest family of Rome. Richness brought nobility and the need for appropriate palaces and villas. The Torlonia acquired a large estate on the right side of Via Nomentana and in 1802 they commissioned to Luigi Valadier the design of its main building. The Casino was repeatedly modified in the XIXth century but its entrance retains the original Neoclassic design by Valadier. The Casino and some of the smaller buildings show other examples of the decoration prevailing at the beginning of the XIXth century. In 1842 Prince Alessandro Torlonia embellished the gardens with two brand new obelisks, cut in a marble quarry near Lago Maggiore in northern Italy and brought to Rome by ship, in a sort of repetition of the transportation of the Egyptian obelisks carried by the Roman emperors. Because of the lack of Roman ruins, some fake ruins were built, which are clearly inspired by Tempio di Venere e Romolo. One of the minor buildings had the shape of a Swiss chalet, but at the beginning of the XXth century it was given a medieval appearance which was again modified in 1920 and decorated with fine stained glass windows, one of which shows the Barberini's coat of arms. The Casino of Villa Massimo can still be seen in Via di Villa Ricotti and notwithstanding some alterations it shows its original design. Of the large park which once surrounded Villa Massimo very little is left; the remaining very high pine-trees can still be seen in a little garden in Via di Villa Massimo. Villa Paganini, named after owner Roberto Paganini who bought it in 1888, once belonged to Cardinal Giulio Alberoni (1664-1752) who was for some time Prime Minister of the King of Spain. He bought and embellished an existing Villa. The Villa is lost apart from an old gate, which now leads to a school (this explains why it is painted in red and yellow, the colours of the Roma football team). In Vicolo della Fontana there is an old fountain decorated with the coat of arms of Innocentius X. An inscription explains how Sixtus V and his successors Gregorius XIV and Clemens VIII allowed the owners of the Villa to receive some water from Acqua Felice. Casino e Villa Patrizi Tra i pregi, che ha questo nobilissimo Casino, è molto particolare quello di avervi alloggiato la notte de' 3. di Novembre dell'anno 1744. il Re delle due Sicilie, oggi invittissimo Monarca delle Spagne.